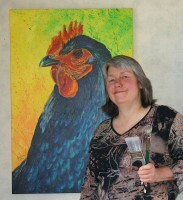 I love using pure bold bright color to express my feelings and show the energy and spirit of the animals I paint. 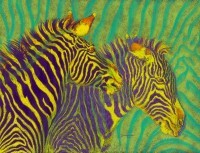 Wild Horses, zebras, aligators, tigers, roosters and fantasy animals are some of my favorite subjects. Please visit my website to see more of my art or to purchase originals or signed limited editions prints on fine art paper or gallery wrap canvas. Wine label artist for Ste. Michelle's 14 Hands brand.